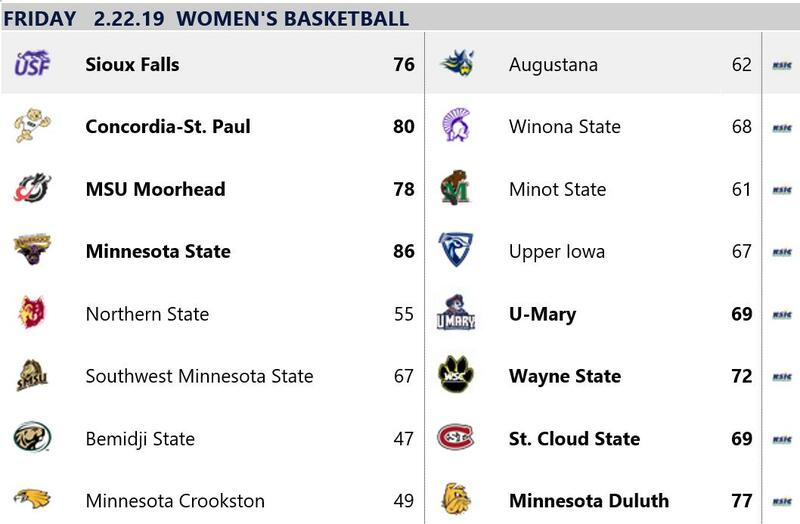 As much as everyone likes to pick on Crookston...my goodness it is hard to imagine having a bigger uphill battle than turning around Upper Iowa womens hoops. A minute into the 1st quarter the NasU woman were leading 16-9. Time with the lead, NSU 13:10 and now Duluth 15:48. Bulldogs lead 58-35....wow. As we know, this isnt a good year for the Wolves but Duluth has look very good and I sure hope, for their sake, they can make it into the regional. Not as good as the Augie or NSU team of last year, but good enough to be deserving. Last edited by Stanger86; 02-15-2019 at 07:17 PM. SMSU wins 90-46. Per Twitter, that's the biggest blowout win for SMSU against D2 schools since beating Morris in the 2002 NSIC Tournament. Mustangs went 24-8 and lost to SDSU in the region championship that year. This is also why I believe it's good to hire coaches with strong ties to a region or school. In many cases, a coach with no ties would take the turnaround at SMSU or a potential turnaround at UIU and use it as a stepping stone to a bigger job. Not saying a coach like Webb wouldn't do that or that all non-local coaches use their jobs as stepping stones, but I think it's harder to pull away a coach when there's strong ties keeping him at the school. Hard not to be pleased with the current state of SMSU basketball, with two SMSU alums leading the programs. I kind of get what you ate saying but if someone is using a place as a stepping stone winning virtually no games, their next stone is going to be a new line of work. It's addicting! My wife yells at me all the time. "You really need to just get a job doing all that stuff. You are ridiculous." Mav women led 41-31 at half. In the third quarter Droost finally scored right before the buzzer to bring the total points to five in that stanza. Throw in a whole bunch of turnovers and the final result was the same as the men's game. Another disappointment. Mavs win 86-67 as Upper Iowa remains winless in the NSIC. 4 Mavs in double figures- and I have no idea why their leading scorer Taylor Droost didn't play. Final: @USFcougars_wbb 76, @AugieWBB 62. Kaely Hummel with 28 points for the Cougars, who win their 7th straight and 20th of the year. Moorhead clinches share of overall NSIC title. Concordia clinches share of South title. Congratulations to Moorhead women on securing the nsic regular season championship. Also, only one senior on the team. Future is bright. The current No. 5 seed in the North would have the eighth-best record in the South.